Ian Graham puts the wheels in motion on his band Cheap Girls, just as his brother Ben was making a whole set of other big life decisions. So despite the fact that Ben had just gotten married and bought a house, Ian asked him to drum in his power-pop trio anyway. All three members were pretty much in between bands, when Ian Graham figured the only way to get his next project started would be to write his own songs. And now, the brothers along with Adam Aymor have become road warriors, building buzz with their fuzzy, no-frills songs. “I don’t think we ever planned to be as involved as we got,” Ian Graham says. 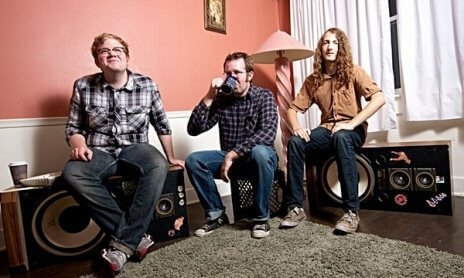 The band released their third album, Giant Orange, earlier this year on Rise Records. The band and the label started talking last summer, as the band began sending Rise a host of demo recordings from the past year. The label was interested immediately. Even before the signing, the band had already cemented their plans for recording the album. Tom Gabel of Against Me! had agreed to take on the Cheap Girls album as his first project with an outside band. “We had planned on that for quite awhile,” Ian Graham says. Gabel and the Cheap Girls got to know each other after several tours together, where they became friends. The plan was the same for making the record, whether the band had a label in place or not. “From the beginning, we were going to do what it took to make the record,” Ian Graham says. Gabel came to the band’s home in Lansing, Mich. a few times to sit in on practices. When the band’s batch of songs were ready, they traveled down to Florida to record the album. Most of the studio time was dedicated to making sure all the parts were exact — things like getting the right snare drum sound or the right guitar lead on a song. Other than that, there wasn’t much change in how the band recorded the album from how they recorded their older LP’s. The only big change is that the first two albums were produced entirely by the band. “It’s the only time that we worked with anyone that might be considered a producer,” Ian Graham says. And it’s not like Gabel entered some weird super-producer head space though. It was more like having someone there outside of the band to guide them. “It was just like have a fourth opinion, but a very good one,” Ian Graham says. Ian Graham starts out most songs as acoustic version, while imagining how he would want certain parts to sound in the full band version. The idea that it won’t just be a little, acoustic tune fuels the songwriting, he says. The songs grow once the band gets together and play the tunes a bunch of times. While Ian Graham says he tries to not be conscious of how his songs come out at first, he says he’s always been draw to quick, seemingly simple, melodic songs. For him, the band is able to do everything he wants musically. “There’s a cool enjoyment to the immediacy of something that works or doesn’t,” Ian Graham says. Trying something longer or with a more experimental structure just isn’t in his head, Ian Graham says. Even when he’s tried more adventurous thoughts or musical ideas, they have felt forced and unnatural to his writing style. The band still keeps its home base in Lansing, where Ian Graham and Aymor live together and brother Ben is only a few miles away. The kids from Michigan State University don’t venture over much from East Lansing, so Lansing itself is mostly a gray, working-class city, Ian Graham says. That place is Mac’s Bar, a 200-person capacity room that hosted the first Cheap Girls show and a whole mess of of the band’s shows afterwards. Meanwhile, the growth of the band has highlighted the brotherly bond between the Grahams. Ian says he’s become aware of how they play off of each other now, as people seem to always ask about their sibling dynamic. “Now i start to realize every time we get into an argument,” he says. But the two don’t really fight that much and have learned over the course of growing up that it’s best to let some things slide. “We don’t let each other get too pissed off,” he says. Cheap Girls w/ Andrew Jackson Jihad, Laura Stevenson & the Cans and the Sidekicks play the Slowdown, 729 N. 14th St., Wednesday, March 21st at 8 p.m. Tickets are $15. For more information, visit theslowdown.com.